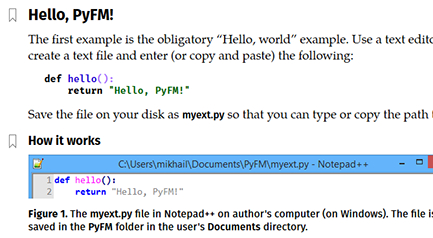 PyFM is a universal extensible FileMaker® plug-in that allows you to write plug-in functions using the easy-to-use Python™ programming language. Use the plug-in to extend your FileMaker solution with all the power of Python and quickly write unique code for your special cases. This is a beta version; it may not be stable and may even crash FileMaker. A hands-on tutorial to make a small PyFM extension with three simple functions. Write functions with variable number of parameters, work with FileMaker containers, handle errors, and in the end permanently the extension to the plug-in library. Read more.